Do you ever find yourself piecing together a chain of seemingly unconnected events, but in the end you realize they might not have been quite so coincidental after all? 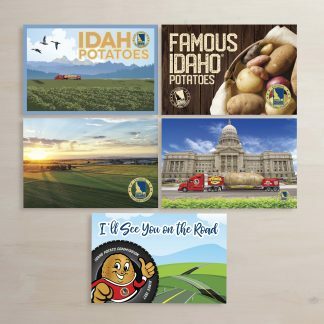 Here’s an example: this tour is about Idaho potatoes– Simplot grows Idaho potatoes- Simplot worked with McDonalds’ founder- McDonalds’ symbol is the golden arches- St. Louis has a massive arch- we have a massive potato- both were brought together this last week. The only logical conclusion: it was fate. 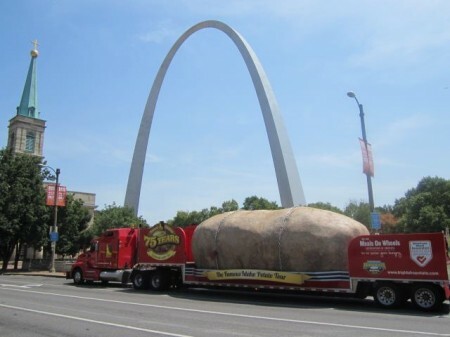 The Tater Team united the two architectural wonders under the Missouri sun next to the Mississippi River in what could only be considered a ‘landmark’ event. Tourists visiting the area certainly got more than they had anticipated. 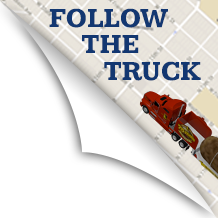 After the team left the Arch, they decided to make a surprise visit to a local potato chip producer. 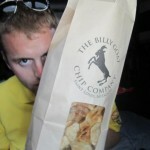 The Billy Goat Chip Company contacted the team via Facebook several months earlier, dangling a meet in greet opportunity for them for when they came to the St. Louis area. Well, the team hadn’t forgotten and they decided to cash in the invite. 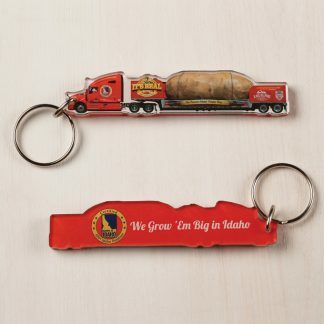 So, completely unannounced, the Tater Team rolled into the cozy little neighborhood that was home to the humble potato frying facility. Eyes bulged and mouths dropped as the Billy Goat employees watched the giant tuber stretch the length of their building. Entering the facility was an experience all on its own. 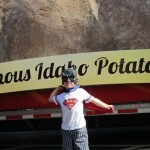 People, equipment and bags of chips were everywhere with Idaho potato boxes stacked to the ceiling. A short tour led them to the backroom where a huge deep fryer filled the space and its caramel-colored liquid bubbled anxiously. 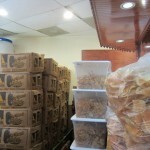 On their way out the crew loaded them up with a huge bag of their finest long cut potato chips… they didn’t last long. Anyone who has been anywhere in the United States lately has probably noticed that it has been a little warm. Well our potato thought so too. 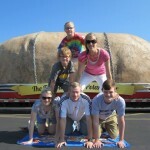 That being said, the oversized spud’s gravitational pull is still drawing in throngs of people at every event. In fact, the only constant thing over the course of this tour has been people’s reactions. 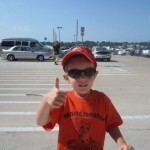 The ‘awe’, the excitement, the questions; all have created a constant high since day one. And even more rewarding are the deeper connections and shared experiences with certain fans that are touched by the team’s travels. Many of these are generated by our shared mission with Meals On Wheels. The slogan riding on the back of our trailer is a beacon for many who have received, donated or participated. 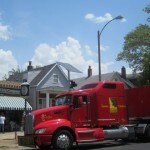 This week we had the pleasure of meeting a man who has been delivering meals for 25 years. And experience like this doesn’t come without its insights. What he has realized is that Meals On Wheels satisfies more than a physical need by delivering food. It also satisfies an emotional and social need by giving the recipients a conduit for outside contact. For many, this is the only contact they get. And for him, it provides a world of satisfaction in his life. 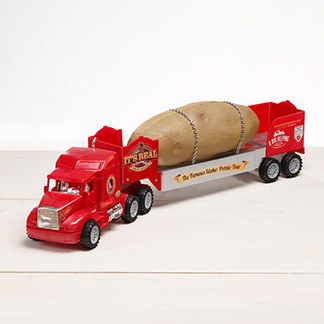 It is mutual for the Tater Team. But enough of that mushy stuff! The team wrapped up the week with a high profile event in Bentonville, Arkansas. 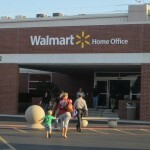 That’s right, the home of Walmart’s global headquarters. They brought in some high profile guest speakers (Clay Matthews from Greenbay and Mark Zuckerberg from Facebook) for their 50th anniversary, and it was only fitting that we combine the celebration of our 75th anniversary. Many veteran employees stopped by and our Tater Team even had the pleasure of meeting Walmart’s Tater Team! 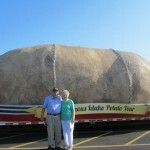 Their potato crew is headed by the one and only, Scott Dray, produce director. 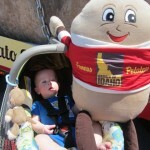 His family has roots in the great Potato State and they were more than willing to get their hands dirty in the name of fun (see picture below). From Bentonville the team shot straight up to Kansas City, a place where they are not strangers. A week of exciting events has got them bunked up in one of Kansas City’s finest hotels, Hotel Phillips, which is notorious for being haunted…Be sure to check back next week for all the ‘horrifying’, yet exciting, details.